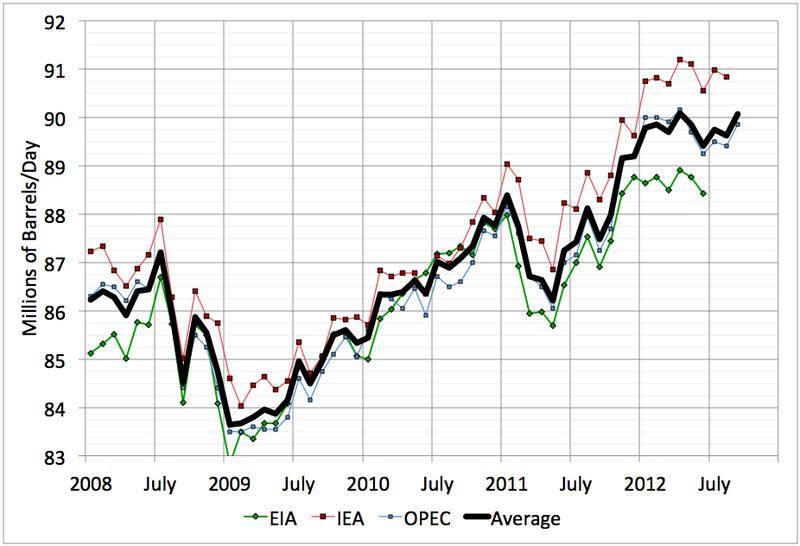 OPEC has released their number for September monthly oil supply. I have updated my summary graph above accordingly. The IEA number will be out on Friday and if it shows any interesting divergence I may update the graph again. At the moment it looks like September was up a few hundred kbd - enough to erase the very small fall in supply this summer, but not enough to erase the general impression of overall flat supply in 2012. PS. Sorry for the lousy blogging so far this week - I was on work travel to Japan and between work commitments and jet-lag was not able to keep up on the blog. Since it seems to me that the currency of the realm when it comes to blogging is gratitude, please allow me to express mine for your superlative blog. I'm sure everyone understands when your blogging is interrupted or impacted by "real world constraints". A superlative blog! True! Thank you Stuart.